Architectural Vistadesigns Ltd were appointed to seek Planning Permission for 10 dwellings on garden amenity land in Polesworth, Tamworth, which is a great result for the practice and developing garden amenity land for the use of Residential houses. 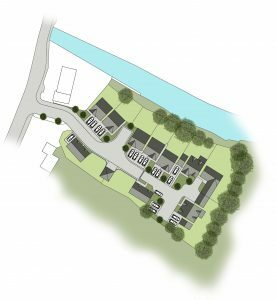 The existing land consisted of 2 dwellings to be demolished for 10 proposed traditional form dwellings with associated parking, amenity land with a Private access drive to serve the site to make it a Private development Cul-de-sac of dwellings. The site boundaries were bound by mature trees and the existing Canal north of the site was a welcomed feature for the houses proposed along the North boundary, which could have a Private access to the Canal front.